We all know the car, the polished-to-perfection Saudi Arabian Audi A8 you get in your email every four to six months, usually from the uncle who doesn't understand the internet telling you those durn furiners got too much money. Well, that car has now been tossed into the waste bin of internet history. 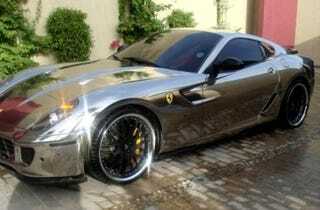 We have a new champion of bling, a fully polished Ferrari 599 GTB Fiorano. While not doused in platinum (as the email always claims), this over-the-top wonder takes advantage of the 599GTB's aluminum body and simply classes up the joint, with thousands of hours of polishing and buffing.